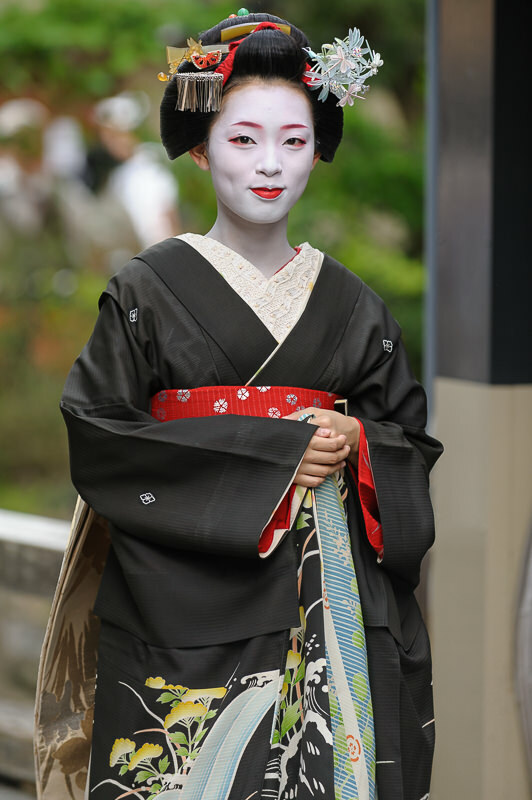 Of all the maiko I photographed from 2007 - 2012, Takahina-san was definitely the most challenging to work with. The three maiko I photographed before her (Yukako, Makiko, and Mamehana) were much easier for me, for a variety of reasons. I had known Yukako and Makiko for about five years and photographed them several times on the streets of Gion before I started photographing them at more formal portrait sessions inside tea houses. I knew their personalities pretty well, and I knew how to connect with them. I had only met Mamehana-san once before I started photographing her, but we clicked right from the first session and just had fun. We would banter playfully throughout our time together. It was all pretty effortless, and then came Takahina. Takahina made me work, and I am grateful for it! It started at either at our first or second session together. I was trying to make a close-up portrait of Takahina they way I had photographed Yukako, who was a geisha at this point, the week before. With Yukako, I could be lazy. All I had to do was say, "Big smile!" and Yukako would smile right on cue, and it would be completely natural, not forced at all. I could give Yukako just one or two words, and those emotions would appear on her face. I asked Takahina to smile, and I got a very different response. Takahina said, completely honestly and plaintively, "But I don't feel like smiling." I was so used to Yukako just smiling, I was taken aback for an instant. I could tell Takahina was not trying to be difficult. I got the feeling that she was lost, and she needed my help. I thought to myself, "Fair enough. If she doesn't feel like smiling, she doesn't feel like smiling. Try something else." "What do you feel like?" I asked her in Japanese. I quickly added, "You don't have to tell me if you don't want to. And you don't have to do anything. Whatever you're feeling now, just feel it. And don't worry. I'll never ask you to do something you don't want to do." I photographed her for a few more minutes, and then I wanted to change lenses. I told Takahina to relax. She was holding a small circular reflector that was bouncing light up into her face, and she started to play with it. When I was ready to resume photographing, Takahina held the reflector up in front of her face so I couldn't see her. She peeked out from behind the edge, and I quickly snapped a photo. And all of a sudden we were playing a game. She would peek out from one of the sides or suddenly lower the reflector for just a split-second. It was my job to try to catch her at the right moment. Sometimes I did, and sometimes I didn't, much to Takahina's glee. She was laughing hysterically by this point, not just smiling. And making funny faces at me, too! I don't think I realized it just then, but I came to understand that I couldn't work with Takahina they way I worked with other maiko. I had to engage Takahina's imagination and intellect. If I gave her a role (or she chose a character) to play that captured her fancy, I could make images unlike those I made with any other maiko. I came to appreciate working with Takahina-san much more. It was not always easy, but she forced me to become a better and more flexible photographer. I think the image of Takahina I posted here captures some of her intelligence, mischievousness, and wit. I hope you do, too!